MIAMI - On Friday morning, the centre of Tropical Storm Harvey was located between Barbados and the Windward Islands, bringing heavy rain and flooding to the area. According to the National Hurricane Center (NHC) in Miami, at 8:00 am EDT, the centre of Tropical Storm Harvey was located about 55 miles (90 km) west of Barbados and about 60 miles (95 km) east-southeast of Saint Lucia, moving toward the west near 18 mph (30 km/h). A continued westward motion with a slight increase in forward speed is expected over the next couple of days. On the forecast track, Harvey should move through the Windward Islands and into the eastern Caribbean Sea on Friday morning. Maximum sustained winds remain near 40 mph (65 km/h) with higher gusts. Some slight strengthening is possible during the next 48 hours. Tropical-storm-force winds extend outward up to 60 miles (95 km) mainly to the north of the centre. A tropical storm warning is in effect for Martinique, Saint Lucia and St Vincent and the Grenadines. A tropical storm watch is in effect for Dominica. 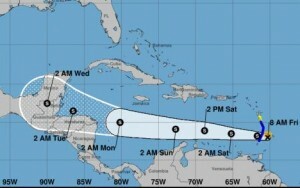 The government of Barbados has discontinued the tropical storm warning for Barbados. All offices in Saint Lucia, commercial and government, remained closed until 1:00 pm on Friday, subject to receiving the all clear by 12:00 noon. Residents were asked to remain indoors and exercise caution. Airports were expected to reopen at 10:00 am. Meanwhile, shower and thunderstorm activity associated with an area of low pressure located about 750 miles east-northeast of the Leeward Islands continues to show signs of organization. While it would take only a slight increase in organization for a tropical depression to form later on Friday, upper-level winds are becoming less favourable for development. The low is expected to move west-northwestward at about 20 mph during the next few days, and interests in the northern Leeward Islands should monitor the progress of this disturbance. The chance of a tropical cyclone forming within the next five days is high (70 percent). Shower activity has also increased during the last 24 hours in association with a tropical wave located over the far eastern Atlantic Ocean, several hundred miles west-southwest of the Cabo Verde Islands. Environmental conditions are forecast to become more favourable for some development early next week while the system moves west-northwestward to northwestward at about 20 mph.